We haven't had such rainy/cloudy weather at the beach during this week in June for many years. But we are still walking 2 miles on the beach in the morning, but then go indoors to the Citarella Café for Coffee and breakfast. This is my ongoing breakfast menu over several days. 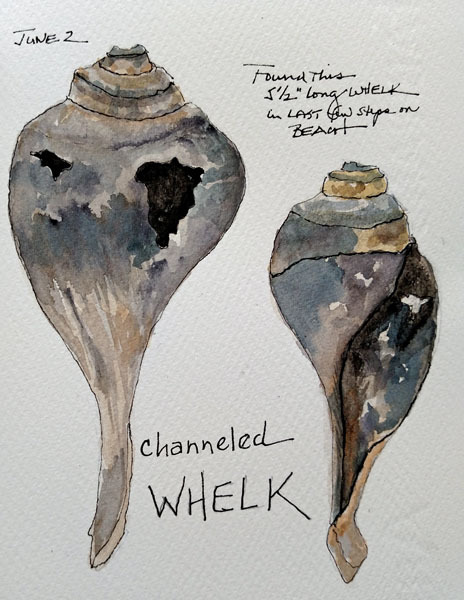 I found a channel whelk on the beach one morning and just had to paint both the front and back sides of the shell. I also found Common Whelk egg cases - a new mystery for me to solve. 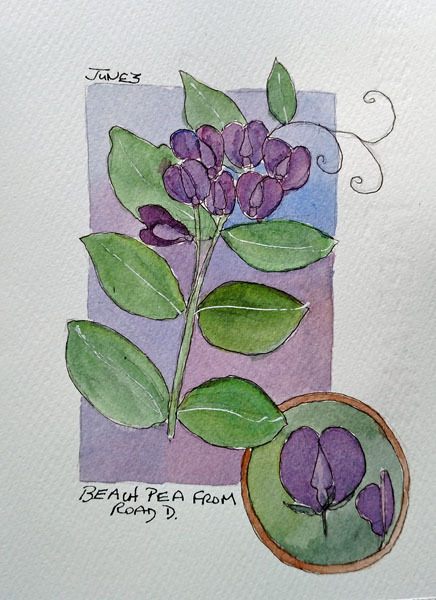 The dunes are covered with blooming Beach Peas and I stopped to draw a few small flowers. We are at the beach for our annual June vacation - lots of early morning beach walks, visiting with friends, relaxing, and eating. 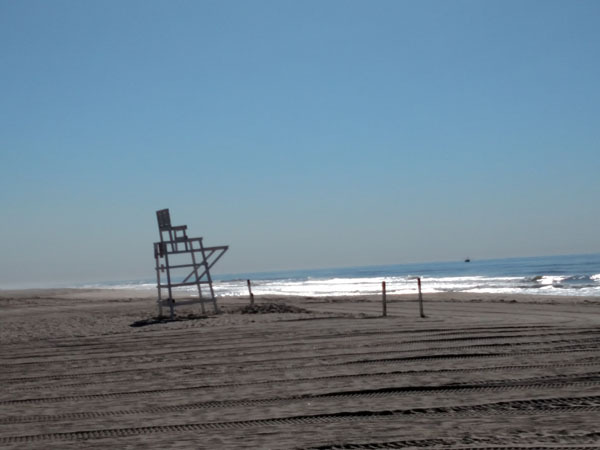 The first two days were foggy for our early morning walk on Cooper's Beach, today we had glorious sun and 54 degrees! I love walking on the beach - watching the ocean, listening to the surf, studying the flight of the sea gulls, collecting shells, and learning about marine biology from the washed up specimens. 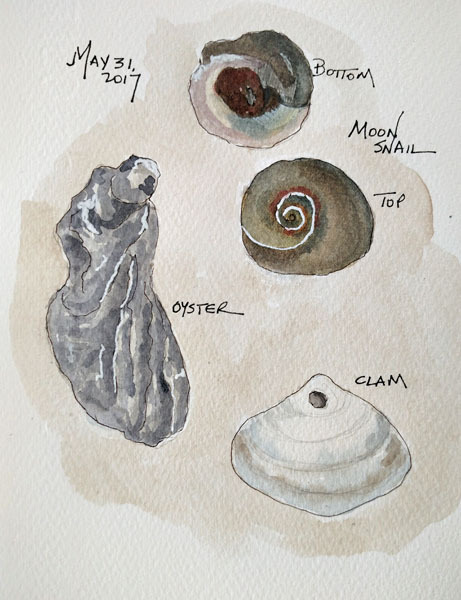 I collected the commonly found mid-Atlantic shells since we arrived and painted each of them in my summer travel sketchbook. This morning I found a large whelk shell and a faux angel wing - both more uncommon on the beaches here. I washed both shells and will allow them to dry before I paint them for my next blog post. 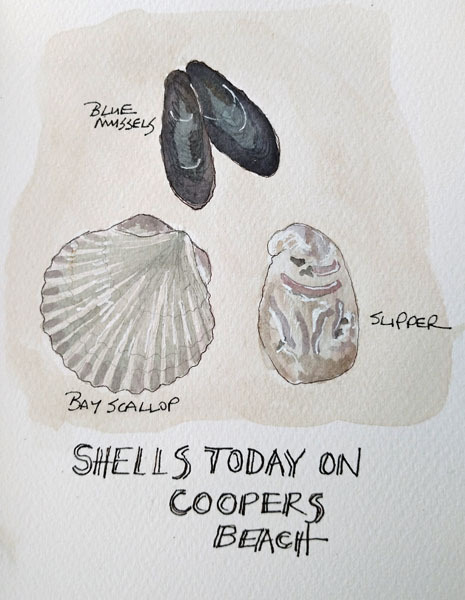 I have a category on the blog that includes all of the previous sketchbook paintings from the beach - shells, and several big mysteries that it took us a while to solve. I was also amazed at the photos of our grandchildren through the years! I like to draw sculpture when I am in art exhibits, and recently sketched several sculptures, and then painted around them in my sketchbook, leaving them as single line drawings. 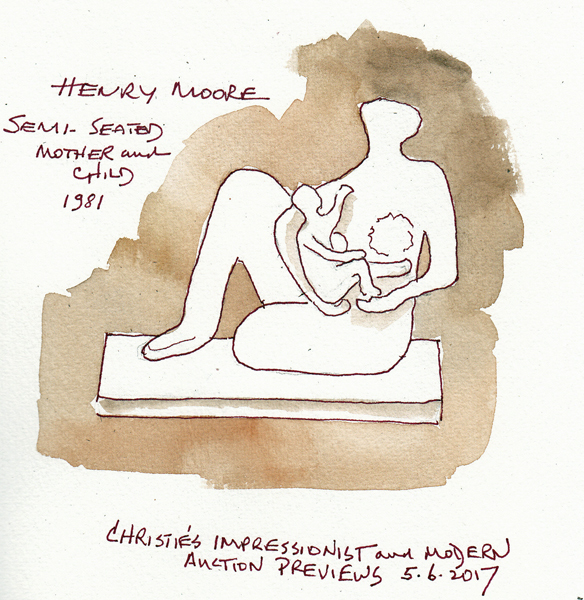 Henry Moore made many Mother and Child sculptures and I love all of them. This small one was in the Impressionist and Modern Auction at Christies, estimated selling price $70-90,000. 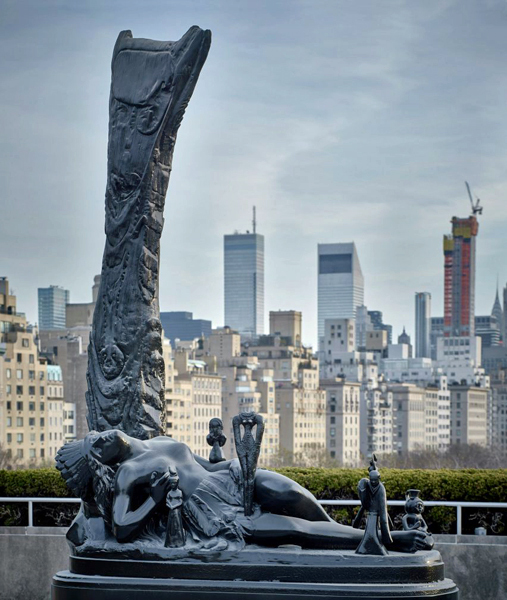 Argentinian artist Adrian Villar Rojas created this year's Met Rooftop Garden this summer. 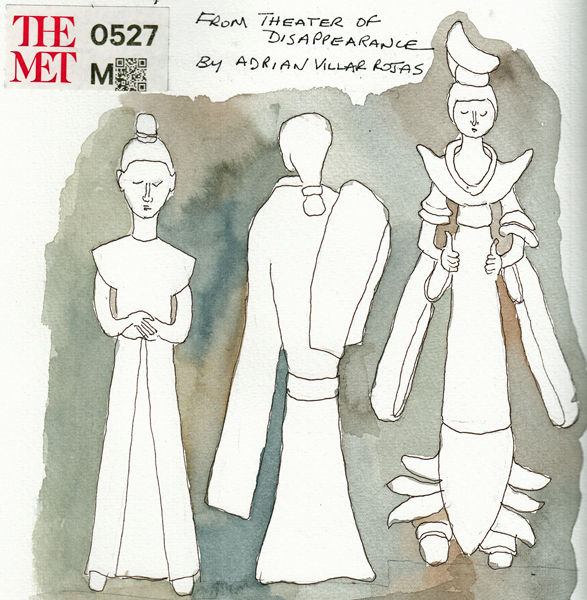 He spent months at the Met collecting nearly 100 pieces of art from various parts of the world and different centuries. Each was then resized, recreated by 3D printing and other similar techniques, and combined with large human figures in many combinations. Each piece was painted with multiple layers of car paint to protect them outdoors. As I understand it, he is representing art that is now no longer in context and deconstructing the Museum by the combinations created creating a labyrinth. I liked one of the black sculptures which included a recumbent Indian youth and multiple small female figures on and around him. Here are three of the figures I really liked. 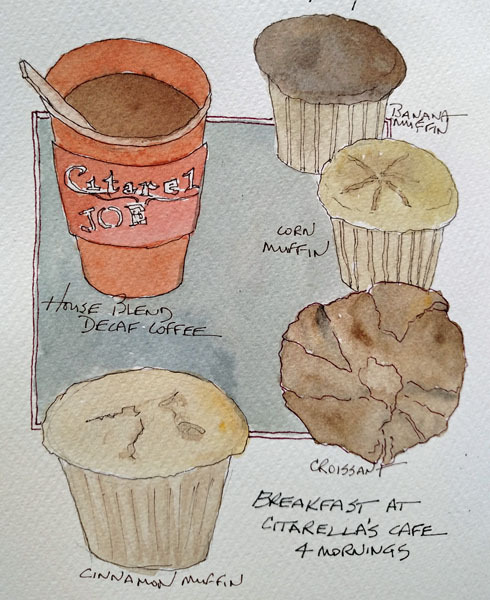 These are the sketchbook pages that I did of constantly Moving Preople, as contrasted with my Architectural Sketches done while sitting and having coffee, wine, or dinner. I like figure drawing and I love trying to capture some aspect of people who I'm watching when they are in constant motion. 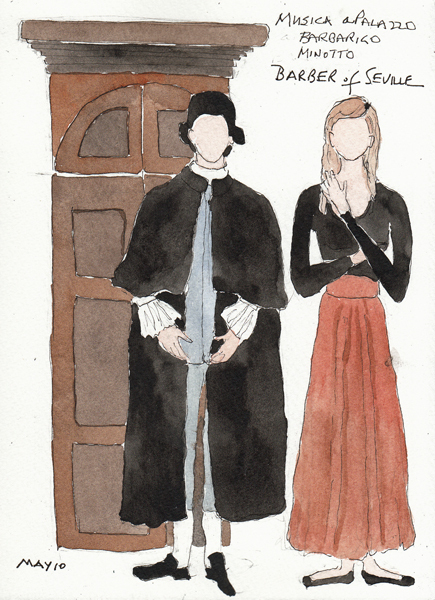 Musica Palazzo: The Barber of Seville at a Palazzo on the Grand Canal. There was a small audience and moved through 4 rooms as we watched. I was never more than 10 feet away from the singers. Fun! 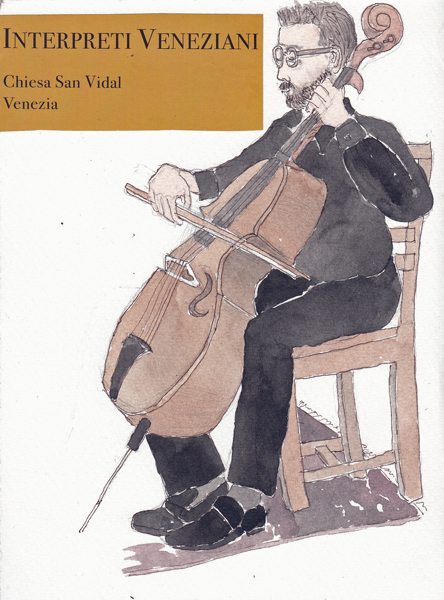 Cellist From Chamber Orchestra at Chiesa San Vidal - mostly Vivaldi Concertos. Excellent and we even got an encore. 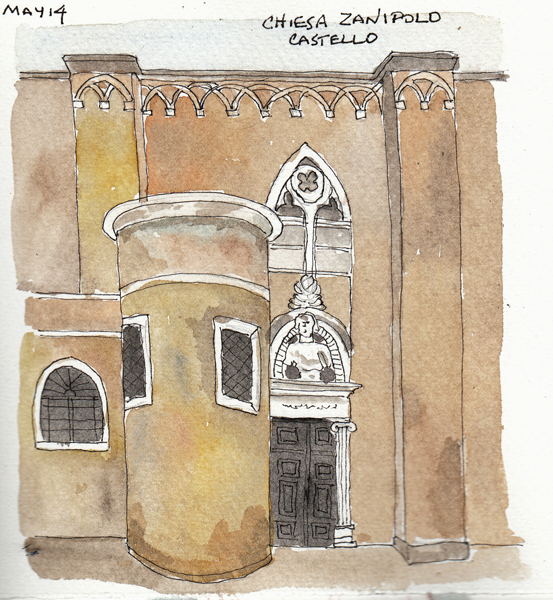 I almost filled my sketchbook, but thought these 3 blog posts captured my favorite Venice scenes and how I made time for sketching while on vacation. 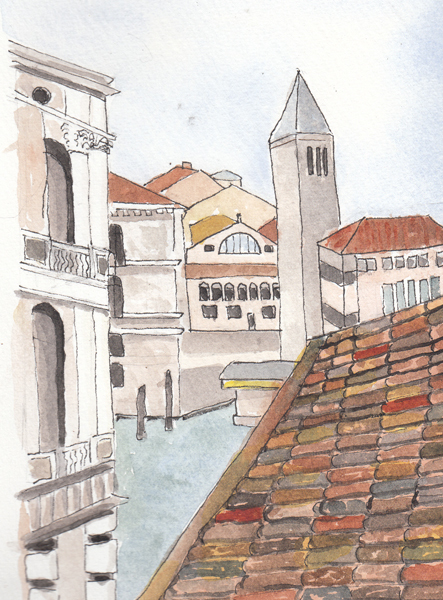 We had a beautiful view from our apartment balcony, and could even see a portion of the Grand Canal. 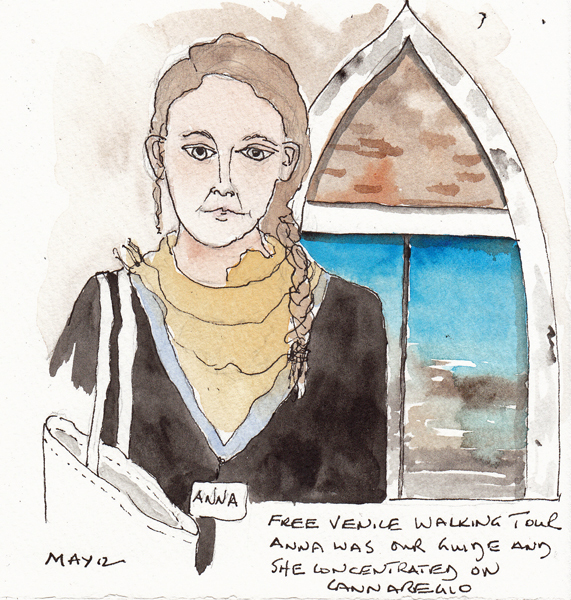 I went out for a morning look and quick photo each day, and finally sketched the scene. I've never painted red tile roofs close-up before, however, and after finding a excellent online tutorial, I waited until we came home to finish the painting. The tiles really looked that varied and were so many colors. 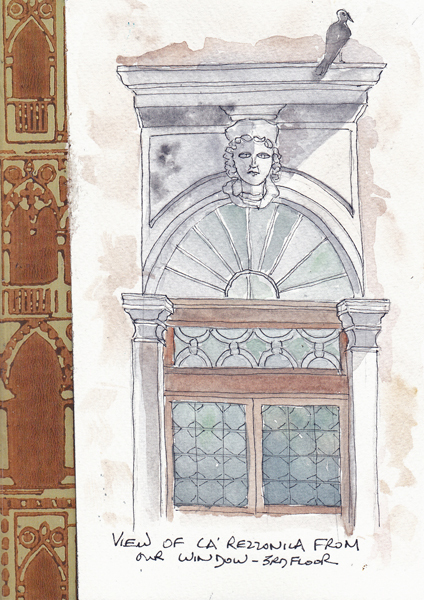 Here are two additional sketchbook pages from the final days in Venice - one drawn while drinking wine in the late afternoon and the other at our last dinner before departure. These are more examples of just drawing what was in front of me. 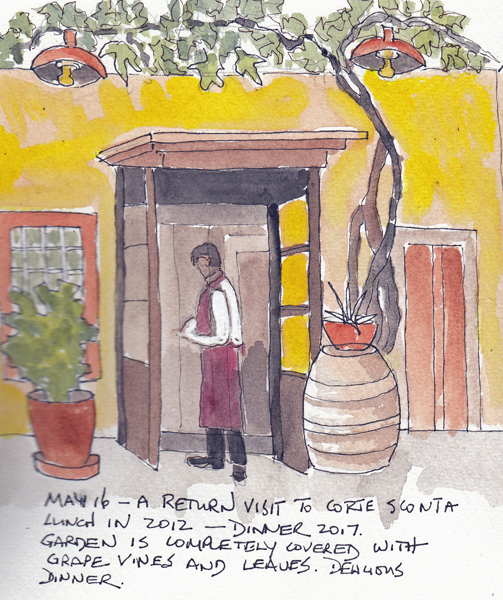 My view from dinner in the garden at Corte Sconta Restaurant- a favorite of ours from a prior visit.